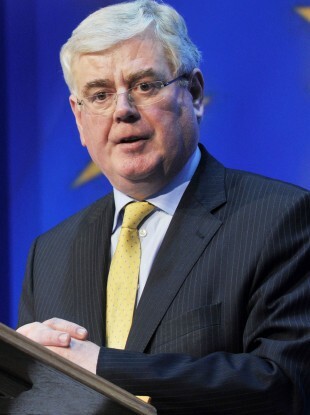 Speaking at the Tom Johnson Summer School in Cork, the Tánaiste Eamon Gilmore says as a partner in government there are things they have not yet achieved, but there have been achievements. Did we manage to achieve everything we wanted? Did we get everything we wanted? The answer to that is no, and it is a no for a very simple reason. This is a coalition Government. The Government is run, not on the Fine Gael Manifesto, or the Labour Manifesto, but on the basis of the Programme for Government which was negotiated after the election and endorsed by the Labour Party Conference. Neither party has had everything its own way. They have shouldered a lot. And it allowed our country to pull back from catastrophe. So when it comes to looking at future budgets, we need to look at how we can give them some breathing room. A break from the relentless grind of paying off the bills every month, only to have little or nothing left over. There is no silver bullet to end hardship, but I believe we must do what we can to make it easier. Gilmore said it’s time Ireland move on to the next target, saying that as Ireland needs to set objectives for what it wants to achieve next. “Exiting the troika programme, is not the end of our work in government – but the beginning,” he said, comparing Ireland to a sick patient. The patient is healing but there is still a long way to go. We all know the problems, and the head winds we face are still strong. The eurozone is still marked by low-growth that hampers our ability to do everything we would desire on job creation and fairness. Email “Gilmore: 'Did we manage to achieve everything we wanted? No, this is a coalition Government'”. Feedback on “Gilmore: 'Did we manage to achieve everything we wanted? No, this is a coalition Government'”.